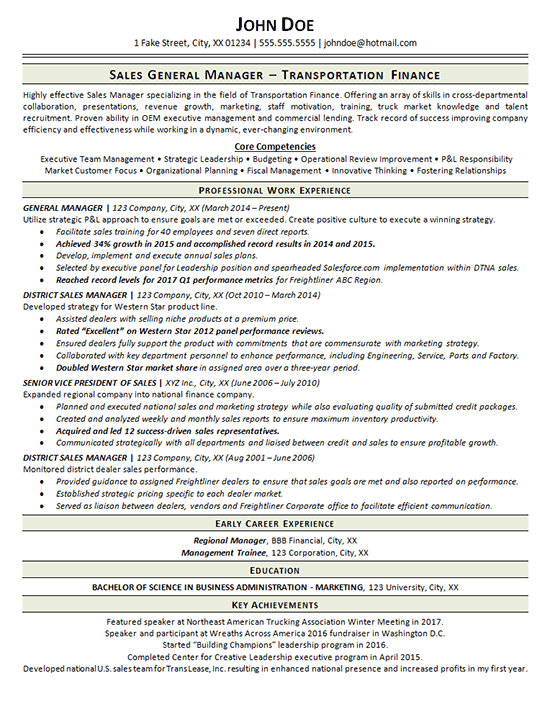 This resume was created for a General Manager/Sales Manager specializing in the transportation field. The client wanted to focus on his knowledge of the trucking industry and his history of success in spearheading revenue growth. The writer emphasized this fact in the Introduction paragraph, then referenced it throughout the resume. Core Competencies were listed to specify strengths of the client that would help potential employers. The most recent four positions were broken down with key achievements and accomplishments. Some of the more relevant and impressive accomplishments were bolded for emphasis. The oldest two positions had responsibilities that were redundant with more recent positions, so they were simply listed under an Early Career Experience section. Following the Education section, Key Achievements were added. Though they didn’t directly fit the job target, the results were impressive and it would be beneficial for potential employers to know about these results when consider this professional for a position. Highly effective Sales Manager specializing in the field of Transportation Finance. Offering an array of skills in cross-departmental collaboration, presentations, revenue growth, marketing, staff motivation, training, truck market knowledge and talent recruitment. Proven ability in OEM executive management and commercial lending. Track record of success improving company efficiency and effectiveness while working in a dynamic, ever-changing environment. Utilize strategic P&L approach to ensure goals are met or exceeded. Create positive culture to execute a winning strategy. Facilitate sales training for 40 employees and seven direct reports. Achieved 34% growth and accomplished record results. Develop, implement and execute annual sales plans. Selected by executive panel for Leadership position and spearheaded Salesforce.com implementation within DTNA sales. Reached record levels for Q1 performance metrics for Freightliner ABC Region. Developed strategy for Western Star product line. Assisted dealers with selling niche products at a premium price. Rated “Excellent” on Western Star panel performance reviews. Ensured dealers fully support the product with commitments that are commensurate with marketing strategy. Collaborated with key department personnel to enhance performance, including Engineering, Service, Parts and Factory. Doubled Western Star market share in assigned area over a three-year period. Expanded regional company into national finance company. Planned and executed national sales and marketing strategy while also evaluating quality of submitted credit packages. Created and analyzed weekly and monthly sales reports to ensure maximum inventory productivity. Acquired and led 12 success-driven sales representatives. Communicated strategically with all departments and liaised between credit and sales to ensure profitable growth. Monitored district dealer sales performance. Provided guidance to assigned Freightliner dealers to ensure that sales goals are met and also reported on performance. Established strategic pricing specific to each dealer market. Served as liaison between dealers, vendors and Freightliner Corporate office to facilitate efficient communication.